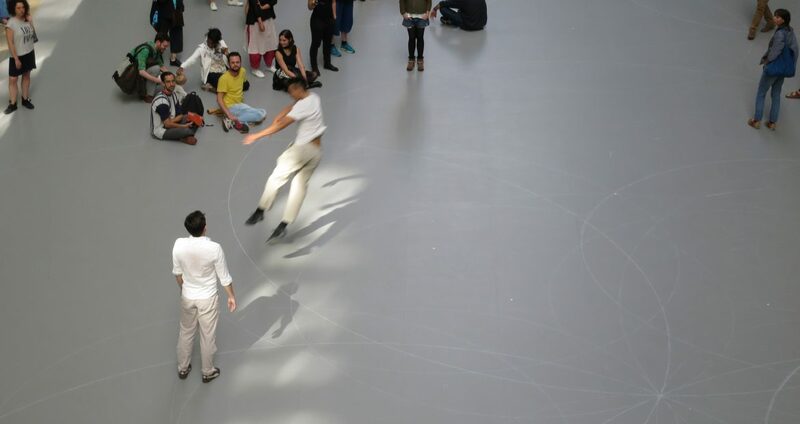 The new work, WORK/ TRAVAIL/ ARBEID, by Anna Theresa deKeersmaeker is a joy to experience. Walking into the upper level of the Turbine Hall at TATE Modern and hearing a crowd clapping has become part of the fabric of my experience at TATE Modern in London, my newfound home. I came here because of the vibrant dance scene and it continues to confirm itself as a leading place for dance. Moving closer to the crowd I am first struck by the number of people gathered and then work on figuring out where to position myself. I go downstairs and set up along the periphery of the laid dance floor. Alright! A dance floor! There is an over 60 meter long sprung dance floor. Grey wood over what feels like a cushion an inch or more thick. The dancers are smartly wearing brightly colored sneakers of their choice and comfort highlighted against their clean, all white, cotton t-shirts and pants. Simple, luxurious, smart. What I most like about this dance is that it dances. It commands space, it speeds up, slows down, engages with the poetically kinesthetic in a way that only dance can. It is dance in a museum on dance’s terms. Amen. It does not try to fit itself into the space of the museum. Or is this space a museum? It is, in fact, a former industrial space. With ceilings so tall no one can imagine this being built for a museum today or perhaps, the new museum in San Francisco has attempted? The acoustics are brilliant in the Turbine Hall. In this large space and with this many people you hear next to nothing but a wonderful hanging stillness. The space, for its size and enormity is, in fact, very calming. I am curious if this was intentional in the original build. All of those extremely loud turbines cracking about as human beings manned them. A space built for machines now occupied and enjoyed by people dancing. Rosas both commands the space and allows space for us, its audience, to be there. Like in public park and unlike Seghal who took the space and claimed it. Not allowing interaction of audience, only its interpreters could ask questions and then walk away at their leisure. With this I feel welcomed without a need to interact as I did the previous night at the work of Hagit Yakira at The Place. The circling and custodian, almost guard like maneuvers of Anna, the dance’s choreographer amuses me. Floating her way between dancers and dancers, audience and audience and between dancers and audience she sometimes seems to be protecting the dancers, sometimes the audience. At other times she seems to simply just be there in the space. Sometimes she turns quickly as a response to her own dance. She seems discerning and I wonder if she minds my taking photos? And the most beautiful scene, seen from above, was the dancers gathering at the end of the space to take their bows and the audience, in one graceful move walked with and towards them, stopping in nearly the exact distanced space as would a proscenium theatre space allow. How smart are these dancers and how smart they make their audience. So rare that dance can move like this in visual art spaces, in old turbine halls and, all the while, illuminate its audience the way this did.